Kosovo Prime Minister Ramush Haradinaj spoke today of the dinner that Kosovo leaders and Prime Minister Edi Rama had a few days ago in Hashim Thaci's new home. Media rumored that Haradinaj was the only one who did not accepted the partition of Kosovo, while Thaci, Rama, Pacolli and Veseli invited him to impose the acceptance of such an agreement. Commenting on these alerts, Haradinaj told to "T7" that he is unwavering in his position for Kosovo to not be partitioned. 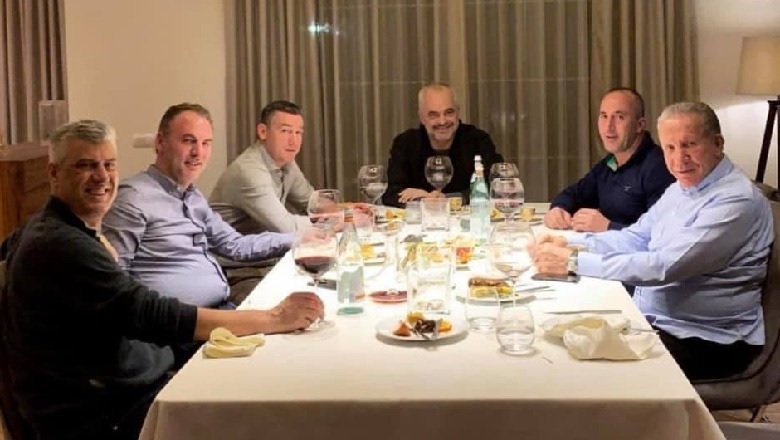 Kosovo Prime Minister also revealed that althow was Edi Rama who initiated this dinner initially foreseen in Tirana and then held in Pristina. "There was an initiative by Prime Minister Edi Rama for a joint meeting. At first it was the idea that the meeting should take place in Tirana, but happened in Pristina. It was a cautious conversation. The same topics we know: tax, dialogue, options for the final settlement. These were the conversations but there was no change in attitudes. There has been a dignified conversation," said Haradinaj. He also revealed the backdrop of the "Leaders' dinner", saying that he finds no reason of the the zeal of some politicians and journalists to change the boundaries. "These are the ones who go and offer themselfe to Brussels and Belgrade with the formula. No one told them to do it...President Hashim Thaci and the journalist Baton Haxhiu have no reason to convince us that this is the right option. We are not ignorant. I see Baton Haxhiu involved in an overwhelming agenda. To convince us of something that is not necessary. I do not understand Mr Haxhiu's mission that he is committed to explaining to us how good this or that option is. He is a journalist and may have his own opinions but cannot seek to persuade the politicians on their ideas," Haradinaj said. The Prime Minister of Kosovo has also explained Edi Rama's role in this situation, saying that the Albanian Prime Minister has engaged and expressed his position on the table, but should stop lobbying, as Kosovo's decision on Kosovo's borders is taken by Kosovo's politicians. "I respect each one's opinion. Let Rama says to his own. His responsibility is Albania. I see him in good shape so far, but he must not give to himself more cargo than can hold. We are the decisionmakers of ourselves," Haradinaj said.